Detailed plans for Parnell Square Cultural Quarter, which will be anchored by a new City Library, were presented in City Hall, on Monday 10 September. The design team, led by Grafton Architects and Shaffrey Architects, is currently finalising the planning application which will be lodged with An Bord Pleanala for consideration in the coming weeks. This major 11,000 square metre project will see a new City Library and a variety of cultural uses located in a terrace of six restored Georgian houses at 23-28 Parnell Square and a dramatic new building to be constructed to the rear. As part of the overall plan, the Georgian houses at No 20 and No 21 Parnell Square will also be redeveloped and a new public plaza created in front of the City Library buildings and Dublin City Gallery The Hugh Lane. 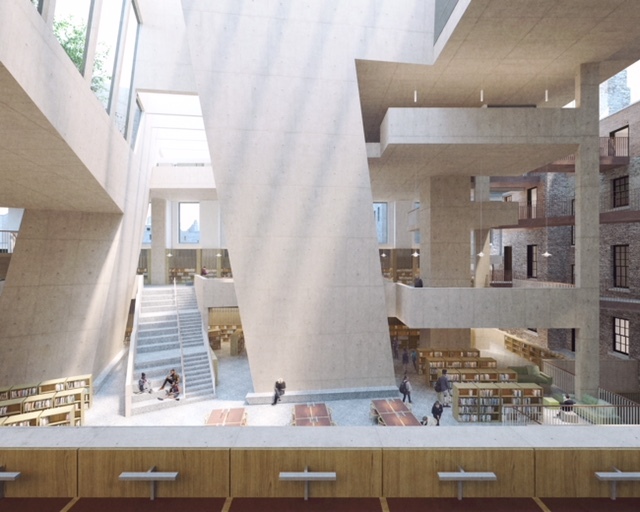 As part of the Parnell Square Cultural Quarter, the Library, in addition to developing a contemporary library space will also have a range of cultural facilities, including a music centre, a design space, an innovation hub and business library, a conference space, an education centre, a café and exhibition areas. Speaking at the launch of the plans, City Architect Ali Grehan said that the project was designed to make the Parnell Square Cultural Quarter a landmark destination that will revitalise Dublin’s historic Civic Spine. “The Public Library and Cultural Quarter will be a magnificent synthesis of historic and contemporary architecture unique to Dublin, drawing people along the pivotal route that connects Christchurch and Dublin Castle, through College Green and O’Connell Street, to Parnell Square,” she said. A model of the design for the new City Library will be on display in the Central Library, Ilac Centre from 12th September until planning is lodged at which time it will be on display in Civic Offices Wood Quay from October. A PLANNING APPLICATION has been lodged with Dublin City Council for a giant street art mural at the Aviva Stadium with a view to discouraging graffiti artists from painting walls in the area. The application has been lodged by New Stadium Designated Activity Company, the company charged with the management of the stadium. No cost projection for the installation has been outlined as yet. The development will consist of “the painting (of) a mural and other surface finishes by a professional street artist(s) to discourage unlawful graffiti and make a positive contribution to the streetscape and surrounding vicinity”, according to planning documents. A controversial Starbucks outlet on Cork city’s main street has closed after a three-year planning battle. It follows enforcement action by Cork City Council in the wake of rulings from An Bord Pleanála that planning permission would be required for the St Patrick’s St cafe to remain in business. The cafe opened in 2015 in a former mobile phone shop. But Starbucks licensed partner and the operator of its stores in Ireland, Entertainment Enterprises Group, never secured planning permission for the change of use of the building. While it argued that what was being sold was consistent with the building’s previous use as a shop, city planners disagreed and the matter was referred to An Bord Pleanála first in 2015. The board agreed the use of the premises as a coffee shop meant it was not exempt from planning. Starbucks then removed the tables, seats and toilets, arguing the location operated strictly as a takeaway and was, therefore, a shop rather than a cafe. For two years, Sean Harris was of the opinion that a wind-farm developer had given him the runaround. He and his family were experiencing problems with the neighbouring wind farm in Ballyduff, Co Waterford. There was the noise, incessant at times. There was the siting of at least one of the 11 turbines, which he was convinced was closer to his boundary than stipulated in the planning permission. And there was something about the size of the damn things. The rotating blades just looked too big. As it was to turn out, Mr Harris and his neighbour, Ronald Krikke, were onto something. The wind farm was not built as per the specific planning permission granted by An Board Pleanála. However, the developer was not to blame. For it would emerge, at the end of a dragged out process in which the pair felt they were really being given the runarourd, that the local authority had actually given the nod to the developer without reference to An Bord Pleanála or, allegedly, the planning file. A planning row has erupted over plans to demolish one of the most beautiful and expensive homes in Ireland with a sea view. A local community group in the upmarket Dublin suburb of Dalkey is mounting opposition to the proposal by a wealthy businessman to knock down Sunnyside — a luxury mansion overlooking Killiney Bay. Ian Curley, the former chief executive of glass and metal company Ardagh, wants to demolish the 520 sq m house located on Vico Rd in Killiney, for which he paid €4.35m in December 2015, and replace it with an even larger dwelling. However, plans for a new three storey, five-bedroom that extends to 582 sq m are being opposed by the Dalkey Community Council. The group lodged an appeal against the recent decision of Dún Laoghaire-Rathdown Council to approve the demolition of Sunnyside and grant planning permission for the new development. A controversial development in the fishing village of Howth in Dublin has been given planning permission by An Bord Pleanála. The decision will see the construction of 164 apartments on a site overlooking Howth harbour and the surrounding coastline, and close to the village centre and the nearby Martello Tower. Local residents had objected to the plan citing concerns including local subsidence. The application was brought by developer Crekav, which recently had separate plans for a development beside St Anne’s Park in nearby Raheny overturned following judicial review proceedings. More than €27 million could be raised by the four Dublin local authorities in 2020 through vacant site levies on land that could be used for housing, according to an analysis by the Department of Housing. Vacant sites worth more than €400 million have been identified at 114 locations across Dublin city and county, the vast majority of which, almost 90, are in the Dublin city area. Since January, local authorities have had the power to impose a levy on property owners who fail to develop prime housing land. The levy, set at 3 per cent of the value of the land for this year and 7 per cent for subsequent years, must be paid from 2019. PLANNING permission for 500 homes near a popular park has been refused by An Bord Pleanala. The development of 432 apartments and 104 houses at St Paul’s College on Sybil Hill Road in Raheny, Dublin, beside St Anne’s Park was initially given the green light earlier this year. It was met with huge public outcry by residents in the area as the green area and playing pitches are used by locals, especially younger members of the community. A number of challenges were brought to the High Court. It was approved under planning legislation which allows applications to be fast tracked and go to An Bord Pleanala without any local authority consultation. In June, the High Court allowed the application to be remitted to the board, who could then make a fresh order on it.Today, they have refused the permission. Cork City Council has approved a planning application for a €125m office development, Penrose Dock on Penrose Quay, spanning 250,000 sq ft across two buildings. Proposed by John Cleary Developments, it says it has the capacity for 2,250 jobs when completed in 2020. The decision to grant the permission comes shortly after BAM/Clarendon Properties got the green light to develop a €160m mixed-use scheme right alongside, called HQ on Horgan’s Quay, in conjunction with land owners CIE. The HQ scheme includes 237 apartments for the letting market, a hotel, and 390,000 sq ft of offices, likely to take four years to complete. Last night, JCD said it hopes to move on site as soon as next month, with 300 construction jobs via builders PJ Hegarty & Sons. It said the Wilson Architecture- designed scheme “is seen as adding substantial momentum to Cork City Council’s Docklands Development Strategy, by bringing balance to both the North and South Quays”. A new 40-bed modular unit designed to alleviate pressure at one of the country's most overcrowded hospitals could be open by next spring after planning permission was secured for the development. Tipperary County Council has given the green light for the E6 million unit at South Tipperary General Hospital in Clonmel, which is regularly near the top of the list for trolley use for patients and often has trolleys in corridors and public areas as well as wards. Consultants and staff at the hospital, which includes maternity services as well as a busy accident and emergency unit, surgery and other acute and general medical facilities, have been pressing for extra accommodation for years to help relieve pressure on beds. An Bord Pleanála has refused planning permission for the proposed conversion of the basement level of a large city centre hotel to provide extra bedrooms, without any natural daylight, claiming such a measure is “unacceptable”. Balrath Investments, owner of the Grafton Capital Hotel on Lower Stephen’s St, near the back of St Stephen’s Green shopping centre, wanted to replace a gym, meeting rooms, and plant with 12 windowless bedrooms. The hotel, which has 128 bedrooms and which once operated the popular Break for the Border bar and nightclub, argued that windowless bedrooms are becoming more commonplace around the world in response to consumer demands. Balrath Investments, which is owned by Eamon Waters, the CEO of Panda Waste, has appealed the decision of Dublin City Council to refuse planning permission for the project. New Government fast-track planning rules have delivered planning permission for more than 4,300 residential units over the past year. In addition to the 4,380 housing units, made up of 2,272 houses and 2,108 apartments, a further 4,085 student bed spaces have secured planning permission under the Government’s Strategic Housing Development legislation. During the same period, a total of 1,575 residential units have been refused by An Bord Pleanála under the new regime. That is according to An Bord Pleanála which has published an official update one year after the introduction of the Government's Strategic Housing Development rules. The board has confirmed that all applications to date have been decided within the mandatory timeline of 16 weeks. The number of planning permissions granted between April and June rose by more than 50% compared to the same period last year, as a conference was told that current planning guidelines are working well. Figures from the Central Statistics Office show that in the second quarter of this year, planning permissions were granted for 6,777 dwelling units, 52% more than the 4,453 in the same period in 2017. Permissions were granted for 4,951 houses in the second quarter (3,630 in Q2 2017), an increase of 36.4%. Planning permissions were granted for 1,826 apartment units — more than double the number in Q2 2017. One-off houses accounted for 19.4% of all new dwelling units granted planning permission in this quarter. The overall picture was reflected at local level. The Focus Ireland annual conference in Cork was told that in Fingal there has been a 23.3% increase in sites with planning permission so far in 2018. So, what determines whether a planning application is refused, granted, delayed, or ultimately abandoned? There is a widely held belief that the “right” planning decision is somehow inevitable (yes it can take a lot of time) but that it’s largely formulaic. It is policy driven. It can be a tedious process, with often endless requests, but nevertheless a fundamentally logical one. Decisions obey a stated set of rules and time frames. Policy reigns supreme. Decisions are largely consistent with other decisions for similar types of applications. The public (if not the applicant) can be guaranteed consistency over time. Well, up to a point. Anybody with more than a couple of experiences (most private sector architects and nearly all developers) with Dublin City Council Planning Department will probably tell you differently. Every developer and architect knows that the singular most important question to determine the likely success of any application is not the “where” (that zoning or this zoning) or the “what” (four floors versus six floors etc.) or even the secrets of the “when” (the Planning Departments own special seasons, “pre-Christmas rush” or the “summer lull”) but the “who” – the actual individual planner dealing with the application. The “who” isn’t so much personal as it is personality types, or planner personality types to be more precise. Two of the most significant development projects planned for Dublin are facing lengthy delays because of a severe backlog of cases before An Bord Pleanála. The board has had to delay decisions, due this month, on both the College Green plaza development and the construction of more than 3,000 homes on the Poolbeg peninsula because it has not been able to process the volume of appeals it receives, it has emerged. - In the event of an application to extend the duration of a permission where substantial works have been carried out, the Planning Authority must be satisfied that an Environmental Impact Assessment (EIA) or Appropriate Assessment (AA) or both was, or were not required, before the permission was granted. - A decision to extend the appropriate period shall not be made more than twice. Where a second decision to extent an appropriate period is made, the combined duration of the 2 extensions of the appropriate period shall not exceed 5 years. The principle amendments to the Principal Act are the establishment and operation of the Office of the Planning Regulator; the inclusion of provisions for the National Planning Framework; and the inclusion of provisions for Marine Spatial Plans. These are subject to a Ministerial Order(s) prior to commencement. - Section 4 of the Principal Act (exempted development) is amended to specify that the construction, maintenance or improvement of private road (other than a public road) serving a forest or woodland can be considered exempted development except where access is provided to a national road within the meaning of the Roads Act 1993. - Section 7(e) of the Principal Act (planning register) is amended to include such further points of detail as are agreed, or deemed to have been agreed, under section 34(5), between the planning authority and the person carrying out the development’. - Section 10 of the Principal Act (content of development plans) is amended to ensure the Development Plan is consistent with specific planning policy requirements specified in Section 28 Guidelines. - Section 11 of the Principal Act (preparation of draft development plan) is amended to provide for the incorporation of the National Planning Framework and a regional spatial and economic strategy into a development plan. - Section 13 of the Principal Act (variation of development plan) provides that Members may submit a resolution to the Chief Executive of the Planning Authority to prepare a report on a proposal by them to initiate a process to consider a variation to the development plan where three quarters of the members have approved such a resolution. The Chief Executive shall submit a report to members within four weeks of the adoption of the resolution. - Section 33 of the Principal Act (regulations regarding applications for permission) provides for a waiver or reduction or a different fee in respect of submissions or observations for Members of a local authority. It also provides for the making and processing by electronic means of planning applications, appeals, payment of fees, etc. as well as requiring the inputting of data by planning authorities into such databases or national planning systems as may be prescribed by the Minister. - Section 34 of the Principal Act (permission for development) includes provision for the planning authority to have regard to previous developments by the applicant which have not been satisfactorily completed, as well as previous convictions against the applicant for non-compliance with the Principal Act, the Building Control Act or the Fire Services Act. This Section is also to include provisions for the planning authority in the case of residential developments of 10 or more houses, to have regard to information concerning implementation by the applicant of any housing development in the previous 5 years, and an assessment of the likelihood of the proposed development being implemented within the appropriate period sought. This Section is also to include provision for the planning authority to a) reach agreement with the person, or (b) either (i) advise the person in writing that they cannot agree, or (ii) refer the matter to the Board for its determination, in respect of points of detail on planning conditions within 8 weeks (or such longer period as may be agreed). In respect of (b)(i) the person may refer the matter to the Board within 4 weeks. Where no response is made within 8 weeks (or such longer period as may be agreed), the planning authority shall be deemed to have agreed to the points of detail as submitted. - Section 35 of the Principal Act (refusal of planning permission for past failures to comply) has been extended to include registered societies under the Industrial and Provident Societies Acts 1893-2014. - Section 41 of the Principal Act (power to vary appropriate period) is amended to provide for power to specify the period during which the permission is to have effect, being a period of (a) not less than 2 years and (b) in the case of residential development, of not more than 10 years. Where an application relates to residential development comprising 10 or more houses, a planning authority may have regard to any information available to it concerning the implementation by the applicant of any housing development in the previous 5 years, as well as an assessment of the likelihood of the permission being implemented within the period sought. - A new Section 44A is inserted in the Principal Act to provide for the revocation or modification of planning permission. The Minister may, upon the request of the Minister for Justice and Equality, Minister of Foreign Affairs and Trade, or the Minister of Defence, and with the approval of Government, make an order revoking, or modifying a grant of permission, whether granted before, on or after the passing of the Planning and Development (Amendment) Act, 2018, but not if the period exceeds 5 years. if they are satisfied that the granted permission is likely to be harmful to (i) the security or defence of the State or (ii) the State’s relations with other states and that the revocation or modification is necessary in the public interest. The notice served will require the cessation of development and the restoration of the land. Any development carried out in contravention of an order shall be unauthorised development. There is provision to revoke an order. - Section 247 (consultations in relation to proposed development) is amended to include provision for at least one pre-planning consultation for development of (i) more than 10 housing units (to include Part V) or non-residential development of more than 1,000 square metres gross floor space, or (ii) such other development as may be prescribed. Such consultations shall be held within 4 weeks of the date of receipt of a request for a meeting, unless extended by a specified period. The failure of the planning authority to comply shall not prevent an applicant from making a planning application. Regulations may be made with respect to this procedure. Gross floor space is clarified as meaning the internal measurement of the floor space on each floor of a building (including internal walls and partitions), disregarding any floor space provided for the parking of vehicles. - The First Schedule of the Principal Act is amended to include provision for an objective regulating, restricting or controlling the development of licensed premises within the meaning of the Licensing Acts 1833 to 2011. Note that this amendment takes effect in respect of a new development plan after the passing of the Planning and Development (Amendment) Act 2018. - The Fourth Schedule of the Principal Act is amended in respect of an application for permission from an applicant associated with a previous development which (a) has not been satisfactorily completed or (b) which has not been taken in charge because the estate has not been completed to the satisfaction of the local authority, as a non-compensatory reason for refusal. This applies whether or not it was within the functional area of the planning authority to which the proposed development relates. - The Seventh Schedule of the Principal Act is amended to include communications and data infrastructure in one or more structure(s), the combined gross floor space of which exceeds 10,000 square metres, and the provision of associated electricity connections infrastructure. - Part 5 of the Derelict Sites Act is also amended to provide for the derelict sites levy (3% of the market value of the urban land concerned, increasing to 7% in 2020 and any subsequent financial year). (iii) the site, or the majority of the site is – Vacant or idle, or Being used for a purpose that does not consist solely or primarily of the provision of housing or the development of the site for the purpose of such provision, provided that the most recent purchase of the site occurred - After it became residential land, and Before, on or after the commencement of section 63 of the Planning and Development (Amendment) Act 2018. - The provisions for the application of the Vacant Site Levy are also amended (3% of the market value in 2018, increasing to 7% in 2019 and every subsequent year). An Bord Pleanala has refused planning permission for a controversial development comprising of more than 500 homes in Dublin. Permission was previously granted in respect of 432 apartments and 104 houses at St Paul's College, Sybil Hill Road, Raheny earlier this year. Residents in the area had protested against the decision as the facility had been used for years as playing pitches for children and teenagers in Raheny. A number of High Court challenges were brought against An Bord Pleanála's original decision to allow Crekav Trading, part of developer Marlet, to build on the site beside St Anne's Park. Margaret Dempsey, who has lived in the area all her life, says the majority of residents are "absolutely delighted with the outcome". Planning permission for a four to five storey development with a cafe, restaurant, and 46 residential dwelling units in Mount Merrion, Co Dublin, has been refused by Dun Laoghaire Rathdown County Council. The application was made by businessmen Paddy McKillen Jr and Matthew Ryan at the site of the former Kiely’s Public House on Deerpark Road, North Avenue and Wilson Road. Several months ago, the Kiely’s site was purchased by the businessmen who opened Union Café with a deli, wine shop and grocers at the front, while the pub underwent a refurbishment and name change to Kennedy’s. The Supreme Court has refused to hear an appeal by local residents over the planned €320 million new runway at Dublin Airport. In a published determination, a three-judge Supreme Court said the matters raised by 22 residents in their appeal over a decision to extend the period of the project’s planning approval did not involve an issue of general public importance. Last February the High Court’s Mr Justice Max Barrett refused permission for leave to bring an appeal of the case to the Court of Appeal. He found no points of exceptional public importance had been raised. The decision followed Mr Justice Barrett’s November judgment rejecting the residents’ case against the runway. Dublin’s developers are sitting on planning permission for more than 25,000 houses and apartments, new figures compiled by the four Dublin local authorities show. The figures from the Dublin housing supply taskforce, to be published by the Department of Housing on Thursday, show that at the end of the first quarter of the year 3,724 houses and 3,629 apartments were under construction across the capital but planning permission for 25,053 homes remained unused. Almost two-third of the permitted but unbuilt homes are apartments. Despite the strong recovery in Dublin property prices, the Construction Industry Federation said many schemes that had been granted permission remained “unviable” and developers were likely to hold off on construction of apartments until the Minister for Housing published new height guidelines.